Posted March 23, 2016 by Andrew Curnow & filed under Episodes. 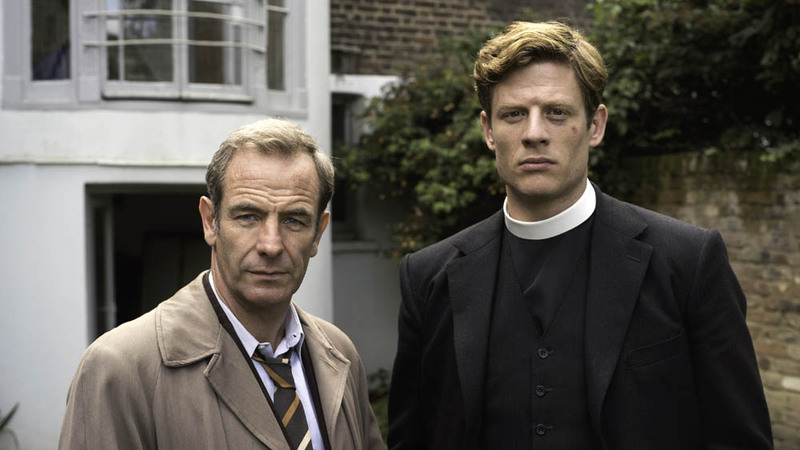 If we think of the second season of Grantchester as a book rather than a series, it starts to make more sense – and as we reach Chapter 4 we can see what it may actually all be about. It’s the story of Sidney; conflicted, flawed human Sidney (“I’m no saint” as he’s remarked more than once already). So what would it be like for a vicar, who has stuck his nose into a murder investigation, only to find that the killer is one of his own parishioners? To know that his actions will have contributed to putting the noose around the neck of one of his flock? That’s the situation this week during the trial of Gary Bell after his arrest in Episode 1. Sidney is torn between helping ‘justice’ and protecting the ‘innocent’, and tying in with the theme is this week’s new case, a revenge killing against a man who killed his wife. Are Geordie, and Abigail’s Father, and Mrs Maguire right, is justice served by ‘an eye for an eye’? “Where does it end?” Sidney asks of this week’s killer – before letting him go. It’s worth mentioning Sam Frenchum who plays Gary, who puts in a strong performance here, both as the desperately scared young man dragged from the dock to await execution, and then later with an almost serene acceptance of his fate. The other conflict for Sidney is Amanda, his love as a man versus his position as a vicar. Worn out by the trial, he seems about to court a married woman – but is stopped short by Amanda’s joyless announcement that she is pregnant. Coming at the end of an episode which deals with the apparent suicide of an unhappy wife, and the tragic outcome of an attempted abortion, I can’t help but worry about what might await us next week. Aired at 9pm on Wednesday 23 March 2016 on ITV.